…is the current exhibition at Two Temple Place ( turn right out of Temple tube station – District & Circle lines – the building is on your left about a hundred yards along, see Undiscovered…. ). Drawn from the antiquities collections of seven different UK museums, it is free to enter, daily, but closed Tuesdays. The exhibition showcases the archeological finds, some of them exquisite, from the ‘golden age’ of British Egyptology, from digs led by Sir Flinders Petrie and others. These focus mainly on appearance and transformation, what the ancient Egyptians wanted to look like, in this life and the next. 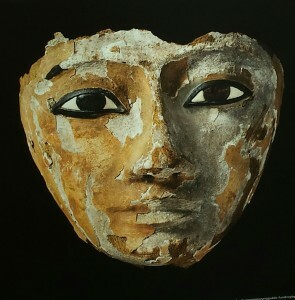 It includes beautiful painted coffins, funerary masks and mummy portraits, as well as mirrors, clothing, jewellery ( some of which I would happily wear today ), cosmetics and beauty tools. Interestingly, both genders in Ancient Egypt used paint and other cosmetics. The heavily outlined eyes which are so distinctive in familiar images of Ancient Egypt belong to both sexes and there is evidence that the lead-based (!) eye-liner also had medicinal properties. Modern scientific analysis finds that, contrary to expectations, the eye-liner, when merged with the salty liquid from the eye, forms an anti-bacterial substance which protects the eye against disease. Clever Ancient Egyptians. Exhibits are from 2500 BCE to the first century CE, so it is possible to see how customs changed. By the later period there are the funerary accoutrements of Greek and Roman residents of Egypt. These include the headpiece of a Roman citizen, Titus Flavius Demetrius, who has decided to be buried in the Egyptian tradition. This is one of the most obvious pieces of ‘bling’ one is likely to see in a museum. Titus might be assimilated into Egyptian culture, but he, or his family, wanted shiny and flash – the shinier the better. ‘subscription system’ in place during the Victorian era and the early twentieth century, whereby monetary contributions from museums (or other institutions or individuals) towards the cost of excavations meant that those museums received a proportion of the ‘finds’ there from. Given that northern England was then very prosperous indeed and had its share of influential people fascinated by Ancient Egypt, many items found their way to museums in Macclesfield, Dewsbury, Bateley, Rochdale and Bolton, as well as to museums elsewhere in the UK like Ipswich, Brighton and Bexhill. Some of these were documented, others were not and this has led to some spectacular ‘re-finds’ like the grave stele of Ramses II’s Vizier, which had languished, unremarked, in a back room of a museum in northern England, until recently identified by a PhD scholar. Yesterday we were fortunate to be taken around the exhibition by Dr Margaret Serpico of the Petrie Museum of Egyptian Archeology, University College, London. Dr Serpico is the curator of the exhibition. Her encyclopaedic knowledge, erudition and wonderful enthusiasm made the tour a huge pleasure. Though potential visitors should note that the exhibits are well described by the case cards and by general information displayed on the walls. This entry was posted in Art, Culture Vulture, History, London and tagged History, London by juliej. Bookmark the permalink.